Inside the Solid Edge Questions & Answers Solutions Vault you’ll find answers to hundreds of previously asked questions from Solid Edge professionals. With a convenient navigation and search system you’ll be able to find exactly what you are looking for very quickly. And you don’t just get text answers. Sometimes it can be difficult to explain the solution to a technical challenge without the assistance of a visual aid. That’s why video answers are so powerful, so where appropriate the answers are enhanced by instructional audio, screen capture video, and downloadable files. How many times have you used a telephone support or helpdesk and found yourself asking the same question again? 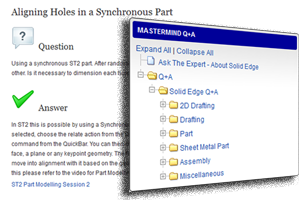 Using the Solid Edge Q&A Solutions Vault you can bookmark chosen questions and answers. The best part is that the vault is continually growing and therefore becomes more and more valuable as fresh new questions and answers are added. Important - If you are a Platinum member of Solid Mastermind you can seek personal advice and ask as many direct questions as you like using Ask The Expert. In our eyes there’s no such thing as a bad or wrong question. This service is ideal for both those desiring a proven, expert Solid Edge support function addressing unique needs, or a high level of personal interaction. Where do you currently turn for advice and support for Solid Edge? You may well have a Solid Edge Maintenance Contract in place but this alone will not give you access to all the advice and support you want and need to be successful with Solid Edge. You may also use the internet to find advice or rely on your local reseller. To obtain the maximum benefits for you, and your business, Solid Mastermind should be at the heart of your advice and support network for Solid Edge. Many support facilities force you to use call logging systems which means that you don't always get immediate or timely answers. Typically service and helpdesks are only available during office hours i.e. 9am to 5.30pm Monday to Friday. It's increasingly difficult to articulate issues by a telephone conversation alone. It can be time consuming to find the right information on the internet. Advice from the internet can be outdated. Advice from the internet can simply be incorrect. It isn't validated and is of variable quality. The expert status of the authors of advice on the internet cannot always be established. You might not be best located geographically to be served by a reseller. You can access the Solid Edge Q&A Vault at your convenience 24/7. You can save considerable time by using a single source for questions and answers. The Solid Edge Q&A Vault is indexed and can be searched to find answers quickly. Answers to many of your questions are probably available immediately without having to submit your own request or wait for a response. The expertise of the Ask The Expert team at Solid Mastermind with Solid Edge is proven and validated. 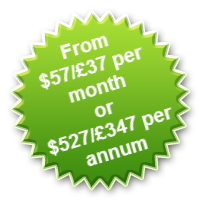 No costly telephone charges are incurred for obtaining support. Support and advice is not restricted and is not dependent upon you having a current Solid Edge Maintenance Contract.